People often ask how the decision of which children to accept into the Joseph Waweru Home School is made. The short answer is that it is not easy. The long answer involves each individual story, lots of prayer and a vote. Personal referrals, churches, Children’s Bureaus, missionaries, serendipitous meetings on the street – all are sources of referrals from the thousands, no millions, of orphaned or rejected children. The work of interviewing is a painful privilege. Here is one short sad story. 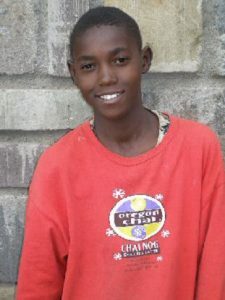 Those of you who read the newsletter know that one of our new boys was from the streets of Nakuru. John Karanja joined our home in February. He was a boy of position in the streets, meaning there wasn’t much he didn’t do to hold an esteemed position among the street boys. He appeared ready to change and get off the streets and withdraw from the glue sniffing. John Karanja Kamau had stolen my heart and seemed happy with us. He was in school and eating and playing basketball. Then there was a small problem in school; a bit of the old fight to get what you want appeared. But it was taken care of and all back to normal. At least we thought. Then one sunny Sunday morning, Karanja was walking to church with the young children, he lifted his hand and waved to me. Little did I know that would be the last time I would see him for a week. Darkness was falling and Karanja did not return. But soon a young man from the neighborhood came to find him. Karanja had requested this boy’s bicycle to go get his Bible. The boy had waited at the church for the return of his bicycle until almost dark. As we discover, Karanja had stolen a laptop computer belonging to the organization, and the bicycle. He took nothing else with him. Monday morning found us in the police station reporting the theft. Our hearts were broken. We truly thought he was ready to change and would enjoy the opportunity for a loving home and education. I was off to another town. I received the message that the bike and the computer had been recovered and that Pastor Waweru had seen Karanja and spoken with him. The street life pulled him back. He asked that his space at our home be given to his brother. We accepted his brother, Gideon. He came to the Joseph Waweru Home School just days after I left. I am told he is fitting in well with the other boys. Later I saw him – John Karanja. His eyes could not meet mine. My heart broke. He still had on his new clothes we had bought him with an old dirty jacket collected from the street over them. The smell of glue was evident. He could not return my embrace. I poured my heart to him, as I know that inside that boy is a caring, soft-hearted, intelligent young man. I told him we will honor his wishes and his brother will have his space. What sorrow to see a young man make poor choices. I left him with a social worker from the referring project and walked down the street with tears in my eyes. This work is hard. He is in God’s hands. He has been seen many times. So lost in glue he cannot walk. Taking his dynamic smile and twisting it to a warped wrinkle. He begs, borrows, steals and whatever he can to eat, sleep and get more glue. Please pray for John Karanja Kamau.